Valencia-born Gustavo Gimeno, former principal percussionist with the Concertgebouw, began his conducting career in 2012, when he was appointed assistant to Mariss Jansons. Three years later he become music director of the Luxembourg band, with whom he is now recording for Pentatone. I must confess Gimeno is new to me, but I see John Quinn reviewed his debut concert with the CBSO in November 2014. In a generally positive piece, he expressed the hope that the Spaniard would return to Birmingham soon. Now here he is, in a programme of early Shostakovich, including the First Symphony. Vladimir Jurowski and the Russian National Orchestra recorded this – and the Sixth Symphony – for Pentatone in 2004. Despite the fact that Chris Howell only gave that release a cautious welcome, I chose it as my key comparative here. (I listened to the stereo DSD64 download, which is also available from NativeDSD.) That said, these accounts of No. 1 face stiff competition from the likes of Kirill Kondrashin (Melodiya/Aulos), Bernard Haitink (Decca) and, most recently, Mark Wigglesworth (BIS). The latter, coupled with Nos. 2 and 3, was a Recording of the Month. 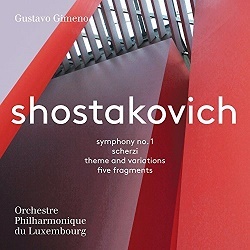 Shostakovich only hit his symphonic stride with the Fourth, composed in 1935-1936. And while the Second and Third seem little more than Party pieces, in the right hands – Sir Mark Elder’s in the former, Wigglesworth’s in the latter – they emit a raw energy that’s quite compelling. The First, Shostakovich’s graduation piece – completed when he was just 19 – is a strange hybrid, with echoes of Tchaikovsky at one extreme and nods to Stravinsky at the other; as such, it’s a work that needs the strongest advocacy if it’s to succeed in performance. Haitink and Wigglesworth both spring the first two movements very well indeed; that’s essential if the composer’s nascent wit – in the symphony’s first half – is to make any impact at all. Alas, Gimeno and his orchestra, elegant and surprisingly supple, don’t quite get there. Indeed, one senses they’re not terribly comfortable with this score, and that’s not a good omen. Yes, there is a hint of satirical edge in the first two movements – played attacca – but it’s blunted by Everett Porter’s full-cream recording. Musically and sonically, Kondrashin and Haitink are more vivid and volatile, and that gives the music essential drive and character. The symphony’s second half – the final movement especially – is a motley affair. The work’s direction of travel may not be very clear, but it does have its moments – that Petrushka-like passage driven by the snare drum, for instance. And while the sound is a little too cosseting for my taste, the presence and impact of key instruments – notably the piano, timps and the bass drum – is pretty impressive; ditto the firm, nicely scaled tuttis. I’m less enthusiastic about the playing which, in the symphony at least, seems only fair to middling. Then again, the orchestra never really gets to grips with the piece in the first place. Of course, the presence of a top-notch ensemble is no guarantee of success, but a seasoned maestro certainly helps. Take Wigglesworth, for example; he draws strongly idiomatic performances from the less-distinguished BBC NOW and Netherlands Radio Philharmonic, with whom he’s has recorded all the Shostakovich symphonies. That said, the old Russian orchestras – their brass sections especially – brought something unique to these works. The RNO, formed in 1990, are a world away from their gruff forebears; the downside is that they don’t sound much different from most top-flight international ensembles these days. I never felt the RNO were at their best under Mikhail Pletnev, their first principal conductor, so I was curious to hear how they’d respond to Jurowski in the Op. 10. Immediately I was struck by the snap and crackle of this performance, helped in no small measure by the crisp, analytical Polyhymnia recording. Really, the contrast between the Gimeno and Jurowski readings couldn’t be starker; at last the composer’s emerging ‘voice’ is audible, and the craft of this teenage creation is laid bare in a way that makes the Spaniard’s traversal seem almost bland by comparison. Jurowski’s strong pulse and emphatic outlines are most welcome; in turn, that ensures a taut, incident-packed performance; he can’t disguise the work’s weaknesses, but at least he can minimise them. As for the RNO, they play with thrilling edge and alacrity, the young composer’s boldness – and occasional rudery – nicely caught. Most important, though, is the sense of coherence, of purpose, that Jurowski brings to the score. In short, this is a most desirable First, made all the more so by its coupling, a fine Sixth that includes an unusually austere account of the Largo. The playing and sound in the latter are beyond reproach. With the exception of the Five Fragments, which dates from 1935, Gimeno’s fillers are all very early works. That follows the pattern set by his first Pentatone release (PTC5186613), which couples the rarely heard Vienna version of Bruckner’s First Symphony (1865-1866) with the Four Orchestral Pieces of 1862. Such programmes allow one to hear composers in their formative years; they can also offer intriguing pointers to their mature works. Shostakovich’s Op. 1, an orchestral Scherzo, was destined to be the third movement of a piano sonata he was writing for his composition teacher, Maximilian Steinberg. It’s not surprising that Glazunov approved of the result, for it could easily be something he’d written himself. Still, it’s a most attractive little number, especially when played with such verve. As for the Op. 3 Theme and Variations, thought to be a compositional exercise, it’s a rather charming piece in which the young Shostakovich shows he’s firmly in control of his material and its transformations. The recording has wonderful detail and a full, rounded bass, which add to the pleasure of these performances. The real gem, though, is the Op. 7 Scherzo, which has its origins in an unfinished piano quintet. Dominated by an irrepressible piano part, it has a bounce and brio that left me wreathed in smiles. Now this is more like the quirky, mischievous composer we know from his later works. Gimeno and his players really seem to be enjoying themselves, and that shows in this easeful and stylish performance. But it’s the now enigmatic, now skein-like Five Fragments that catapults the listener into another world entirely. Given such beautifully nuanced playing and ear-pricking sound, I feel like a churl for panning the first part of this programme. Marina Frolova-Walker’s detailed liner-notes are a welcome bonus. Gimeno makes amends for a dull symphony with some terrific fillers; caveats aside, this could be the start of a most rewarding partnership.